You can use IFC Quick Browser to text-browse even very large IFC files. The IFC file is displayed in a tree structure. IFC Quick Browser is Freeware! After running the installer IFCBrowser.msi , you will find a new menu group G.E.M. Team Solutions with the entry IFC Quick Browser in your Windows start menu. Your feedback about this version is more than welcome. 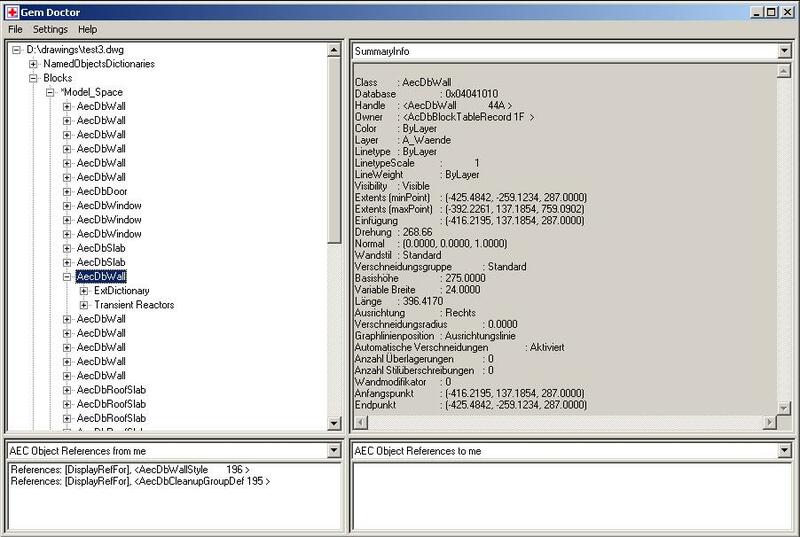 GEMDoctor GEMDoctor is an aid for controlling your software development based on AutoCAD® using ObjectARX and OMF. GEMDoctor runs as an ARX application together with Autodesk® ADT 3.x or ADT 2005. GEMDoctor starts the application GEMDoctor, which runs as a modeless dialog giving a view in the innermost part of the AutoCAD® database. Classhierarchy shows the class hierarchy in the AutoCAD® database. It is also possible to search for a specific classname. Databasereport shows the status in the current AutoCAD® database (objects open for read/write). This version runs 30 days. After that, please request a free authorization code. Please uninstall your existing version of GEMDoctor before installing the new version. After running the installer GEMDoctor.msi, start ADT 3.x or ADT 2005. You will now find a new menu GemDoctor. Your feedback about this version is more than welcome. We try to incorporate your suggestions in the next version of GEMDoctor. Please send your criticism and suggestions to: gemdoctor@team-solutions.de.